I recently had the opportunity to hear a terrific lecture by David Adamkin (University of Louisville) on neonatal nutrition. 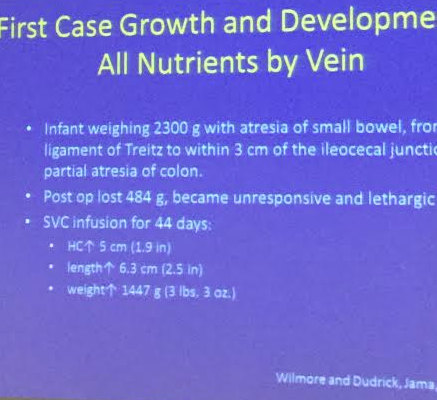 Unlike previous lectures that I’ve highlighted on this blog (Neonatal Nutrition Lecture -What We Know Right Now …) which focused on enteral nutrition and breastmilk. 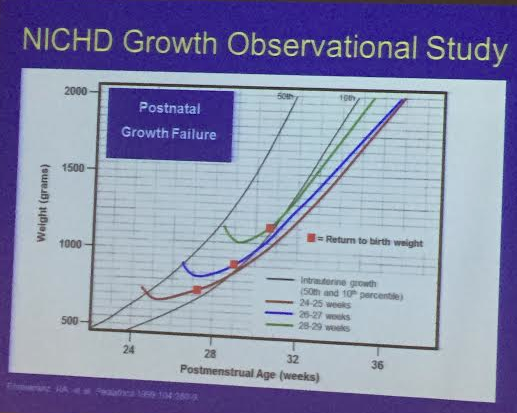 This lecture focused on providing early parenteral nutrition to prevent postnatal growth failure. Introduction of TPN dramatically improved survival for many infants. In disorders like gastroschisis, TPN increased survival from ~10% to 90%. At 24-28 weeks gestational age, fetuses are ‘bathed in amino acids’ and extreme premature infants need early amino acids. At University of Louisville, the neonatologists try to deliver ~3 gm/kg/day of amino acids in 1st 1-2 days in order to match intrauterine growth and prevent growth failure. 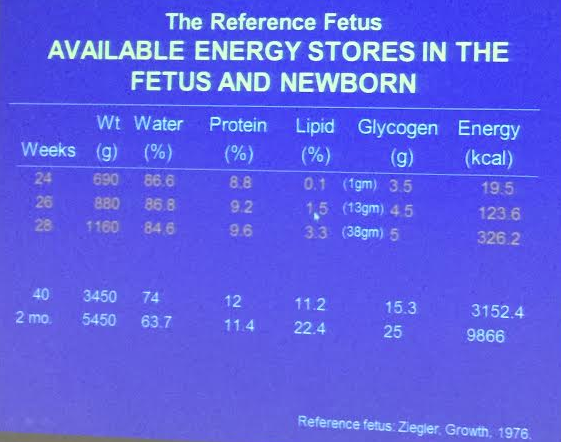 Half of postnatal weight loss is water; other half is related to proteolysis. To facilitate TPN at all hours, they use a stock solution (4% amino acids at 60 mL/kg/day delivers 2.4 mg/kg/day of protein; 80 mL/kg/day delivers 3.2 mg/kg/day of protein. 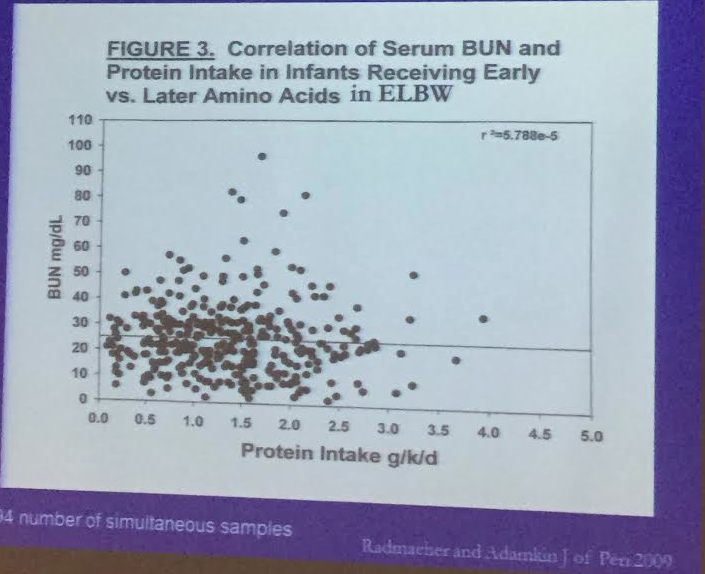 BUN increases with any protein intake but not affected by protein intake -issue has to do renal fxn, comorbidity. Smaller & sicker have higher BUN. 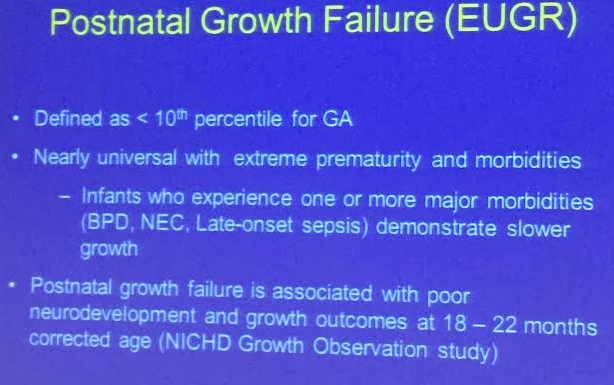 This entry was posted in Nutrition and tagged extreme prematurity, neurodevelopmental outcomes, TPN by gutsandgrowth. Bookmark the permalink.